Had it not been for the astronomic destruction in the background of the pictures and videos, I would have thought the images coming out of Syria yesterday were recycled from 2011. But they weren't. The images were from that day - March 4, 2016 - nearly 5 years to the day from the start of the Syrian revolution. 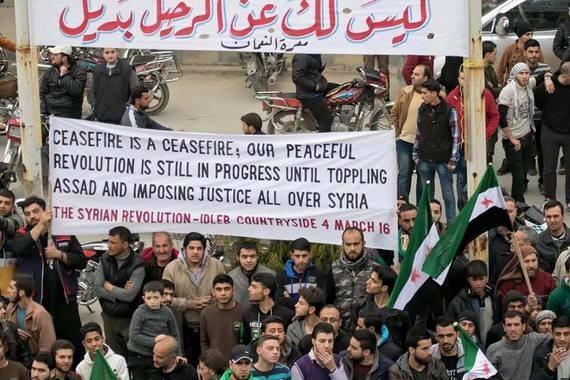 For years I've debated whether the Syrian revolution still exists. 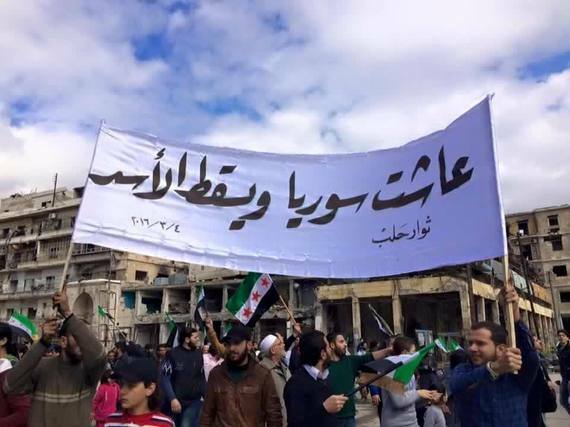 Whether the chants of 2011 still hold true today, "بلا ماهر وبلا بشار وهالعصابة الأسدية سوريا بدها حرية" [Neither Maher nor Bashar nor the Assad mafia, Syria wants freedom] or whether that spark of hope and that longing for democratic reform died and was buried along with the hundreds of thousands of Syrians under the rubble of regime barrel bombs and Russian cluster munitions. 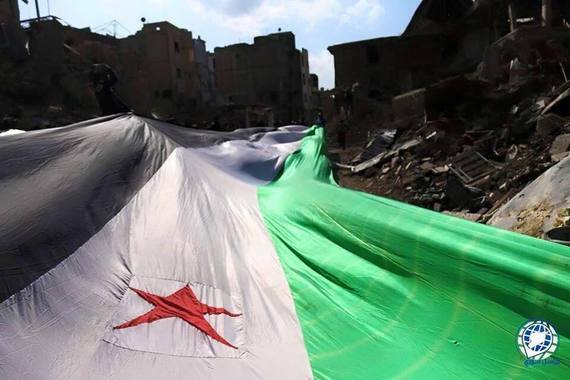 Would we ever see the green revolution flag again or did the brute force of the Assad regime and its Russian and Iranian allies kill the revolutionary spirit and diminish any desire other than the minimal desire to live and eat? 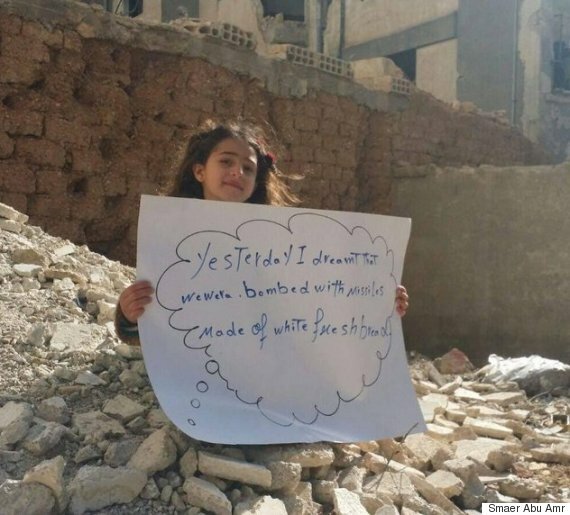 As one young girl in besieged Moadamiya wrote on a poster a few days ago, "Yesterday, I dreamt that we were bombed with missiles made of white fresh bread." How far had the dreams of yonder years fallen. Yesterday, on the seventh day of the cessation of hostilities, I got a call from a friend. "Are you seeing what's happening in Syria." I had purposefully avoided Facebook that day. I needed a mental break. I didn't want to read about the forced starvation of over half a million Syrians or the continued use of chemical weapons on civilians. Nor did I want to see pictures of dismembered women being dug out after an aerial strike or videos of dead children washed onto Turkish and Greek shores as they sought to escape and rebuild a life somewhere in Europe. When I opened my Facebook feed, though, I was shocked by what I saw; shocked in a good way and in a way that I hadn't been shocked in years. 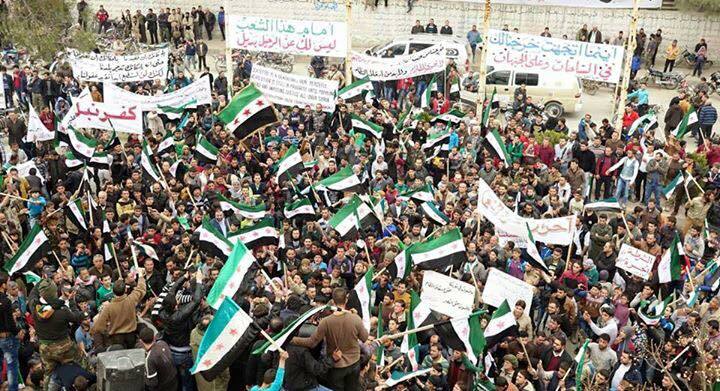 Picture after picture and video after video of Syrians protesting from as far south as Busrat al Sham (Daraa) to as far north as Azaz (Aleppo). 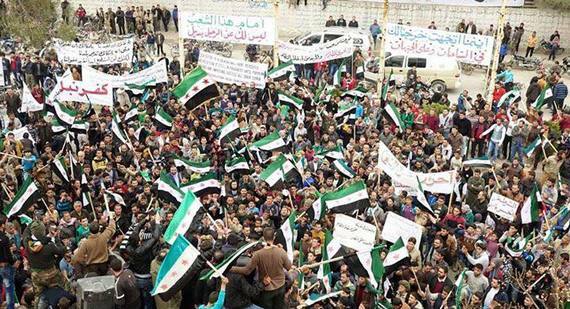 Thousands of Syrians from over 100 locations throughout Syria adorning the green revolution flag and chanting, indeed demanding the overthrow of the regime. Men, women and children who had undoubtedly lost everything from their loved ones to their homes to the livelihoods to even their futures were swaying to the songs of the revolution. Flags meters long intertwined between the demolished buildings in Jobar (Damascus countryside) and the bombed out squares of Muarat al Numan (rural Idlib). Women chanting and frail men dancing, reminding the world that they had not given up on the revolution. 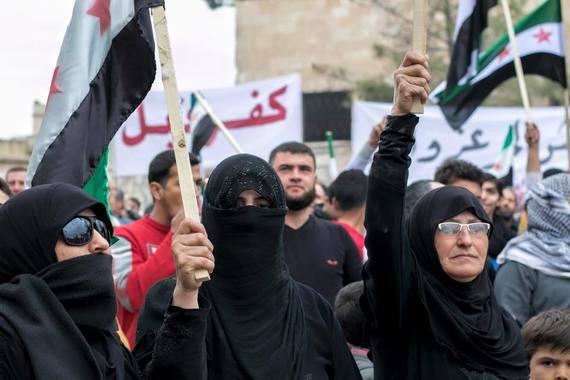 The Assad regime had sought to bomb and starve these people to submission - to force them to forget their demands of a life of dignity and to instead be subdued by the most basic human needs for bread and water. But the regime failed. 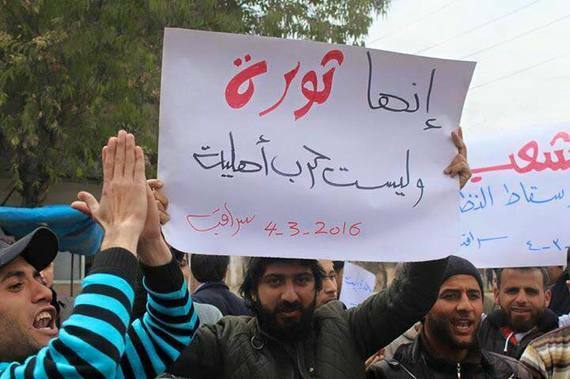 Syrians had not once shifted their focus from the bull's eye - the toppling of Assad and his despotic regime. 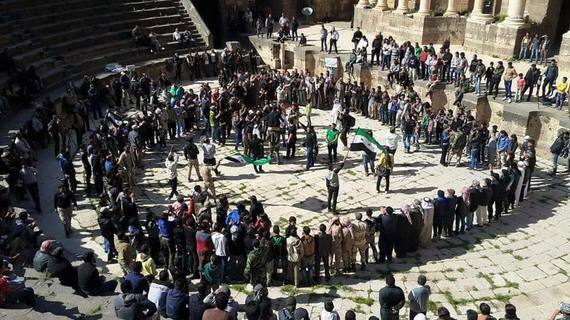 In seeing the images, I understood why Assad was willing to burn down the country to stay in power. Anything short of unrelenting savagery would mean that the Syrian people would continue to rise up and demand his overthrow. Indeed, only a few days of lull after half a decade of unimaginable brutality and the Syrian people were once again out on the streets as they had been in 2011. 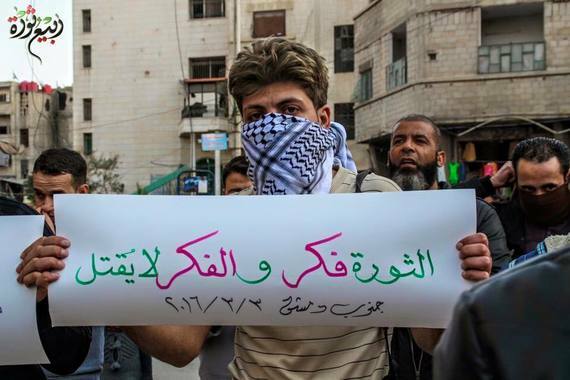 And in their hands, they carried the messages of the revolution. "Our peaceful revolution is still in progress until toppling of Assad and imposing justice all over Syria." 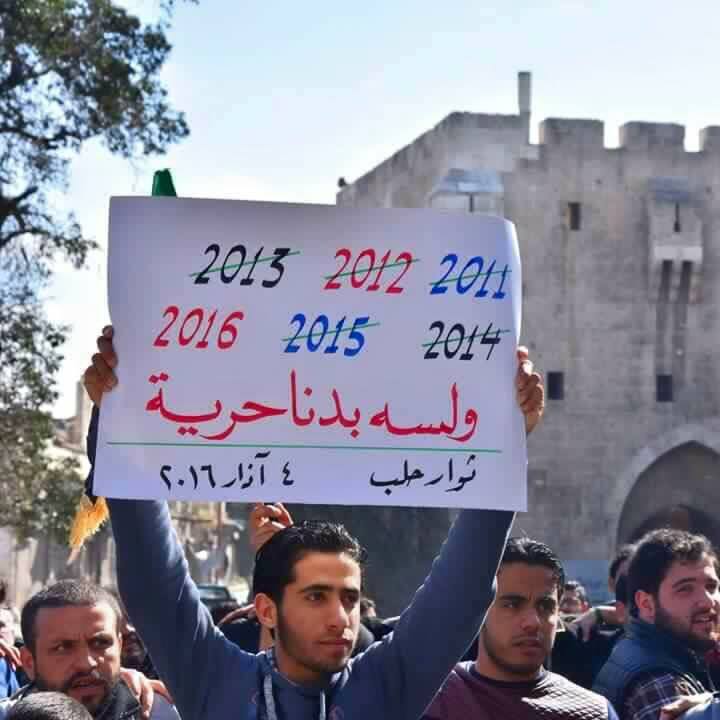 "2011-2012-2013-2014-2015-2016 and we still want freedom." "It is a revolution, not a civil war." "Long live Syria, down with Assad." "Before these people, you have no option but to leave." "Revolution is a conviction and a conviction cannot be killed." Yesterday, I was assured that the revolution still exists. 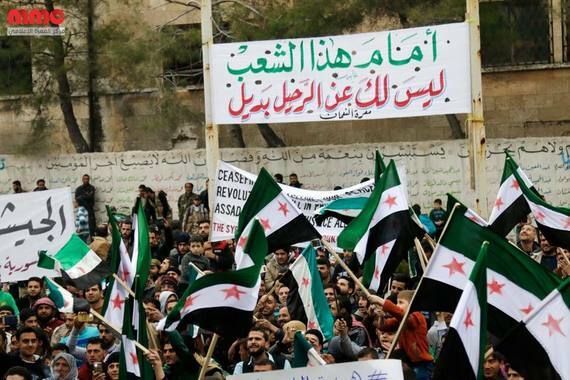 And until every Syrian is killed, until their cities are fully decimated and emptied of their inhabitants and their bodies are covered in white shrouds, the Syrian revolution will remain alive.